We design and build custom cabinets to suit your requirements. What does your cabinet need to do? Pine curio cabinet with 3 tempered glass shelves. The sides have 2 tempered glass panels just like the doors. 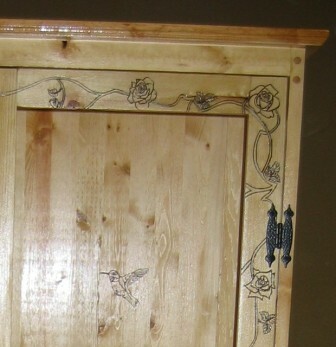 The woodburned pattern is roses and vines. Two humming birds are burned into the back panel just above the top shelf. This cabinet measures 14" deep x 35" wide x 72" tall. Magnetic push-push latches hold the doors closed.